SIRIUS comes with everything that is in Kepler PLUS MORE!!! 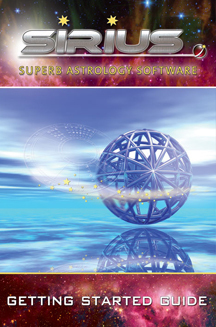 SIRIUS meets the needs of the advanced professional astrologer or researcher. SIRIUS is the most comprehensive astrology program in the world, with advanced features in almost every area of astrology, including modern, Vedic, Medieval, Hellenistic, Huber, harmonics, symmetrical astrology, cosmobiology, financial astrology, and research. The extraordinary features in Sirius are also easy-to-use. SIRIUS is elegant and beautiful, and the advanced features do not get in the way if you primarily use a few basic features of the program. ANCIENT, WESTERN: A few of the new reports you can produce are: Partile and Refranation Table, Essential Dignities Table, Almutens Table, Hyleg and Alcochodon Table, Almudebit Table, Temperament Table, Lunar Mansions Table, Dispositors Table, and Planetary House for Day of Birth. HELLENISTIC NATAL & HELLENISTIC TIME LORDS: Produce a listing of Zodiacal Aphesis, Decennials, 129 Year System, Balbillus Method, Circumambulations, Annual Profection, and Lunar Monomoiria. NEW MODERN METHODS: Composite charts of 3 or more charts, Phase Angle Returns, transiting and progressed 4-planet combinations, aspects in the transiting/natal composite chart, etc. are among a few of a great many new advanced modern features. VEDIC: Chakras, Vargas & Tables, Vedic Natal Interpretation and Listing, Dasas & Bhuktis, Panchanga, Muhurta, Ashtakavarga, Gochara, Shad Bala, Chart Summary, Upagrahas, Bhava Arudha, Special Lagnas, Chara Karaka, etc. CHART WHEEL: Beautiful Nakshatra wheel, Hellenistic wheel, and different sets of patterns, (modern, Huber, symmetrical, and harmonic), a fabulous new Page Designer, a PopUp Wheel, animated BiWheel, TriWheel, QuadWheel, and MANY other new chart wheel features. 90 DEGREE DIAL ANIMATION: Interactively move the Dial in a 360, 180, 120, 72, 60, 45 or 30 Degree Dial to see midpoints that are formed at any point on the Dial. Dials can be regular, BiWheel, TriWheel, or QuadWheel Dials so that you can see midpoints formed between charts. BUSINESS MANAGER: Sirius includes powerful and easy-to-use business management software! With the Business Manager, you can schedule appointments, browse through your appointment schedule to see what upcoming appointments you have, quickly read in the names of people whose data is in Sirius or enter names of new people, and maintain information about these clients, such as postal address, e-mail address, phone numbers, and notes. You can even print envelopes directly from Sirius manager to the printer. There are fields for you to enter credit card information, print receipts, and print envelopes. There is even a timer that you can use to time appointments or other work activities, which is particularly useful when charges are being paid on an hourly rate rather than a flat rate. Even though we designed Business Manager with the professional astrologer in mind, if you are not a professional astrologer, but a professional in some other field, you may wish to use the Business Manager feature of Sirius for your other professional activities. You can also use Business Manager for managing personal appointments and other activities as well. PLANET MANDALAS: Planetary Mandalas reveal that the simple elliptical paths of planets form beautiful and fascinating shapes. Sirius provides innovative features to its Planet Mandalas, and these new features show an extraordinary elegance and beauty that has not been fully seen before. OTHER ANIMATIONS AND DYNAMIC INTERACTIVE FEATURES: View a wheel, BiWheel, TriWheel, QuadWheel or multiple wheels and watch planet positions move dynamically or as you click on arrows to move the charts forward or backward in time. New interactive features for quickly seeing aspects and conjunctions to fixed stars are a big help when doing horary and electional astrology. MEDIEVAL, HELLENISTIC, & OTHER LISTINGS: The Partile and Refranation Table is very helpful for classical horary astrology because you can see exactly when aspects become exact, or refranation occurs. The presentation of useful information like the Temperament Table and the ability to obtain advanced calculations like Compound Almutens and the Alcochodon makes Sirius an excellent program for the classical astrologer. In Kepler some Medieval feature are available, such as a Medieval wheel, including a dignities table, conjunctions of planets to fixed stars, etc., but there are many more Medieval features in Sirius. Kepler can produce a dignities table, and Sirius adds the ability to produce the dignities table using Egyptian bounds. Sirius can also produce a list of Hellenistic influences, with the flexibility to include from among the following items: Dignities and aspects to fixed stars, Dignities of Hellenistic lots and the aspects of the lots to fixed stars, Dwadasamsa and dodekatamoria of planets, Dwadasamsa and dodekatamoria of the lots, and Ascensional times of the zodiac signs. TIME LORDS: Another new feature of Sirius is a list of time lord periods with the following time lord systems available: Zodiacal ephesis, Decennials, 129 Year System, Balbillus Method, Circumambulations, Annual Profections, and Lunar Monomoria. You can select the number of levels desired. The features can be selected easily, with, for example, the ability to right-click to quickly bring up the settings, click a few times to change selections and press the OK button to view the new time lord report. PROFECTION: In Sirius you can produce a list of Profection aspects. Sirius also provides an easy-to-use interface to customize lists of Arabic Parts. ELECTIONAL & ASTROSIGNATURE FORECAST BASED ON MEDIEVAL RULES: In Sirius you can produce an AstroSignature Forecast Graph and an Electional Astrology Graph based on Medieval rules, such as planet and Asc dignities, rulers of houses, Void of Course Moon, planetary hour, and conjunctions to fixed stars. Typically these forecasts are run for one day at a time because the values change frequently throughout the day. PLANETARY HOURS TABLE: A Planetary Hours Table can be produced in Sirius. This is a nicely formatted report, with changes in daylight saving time detected so that the times are very accurate. You can also produce a Planetary Hours Table and Rising Sign that shows both changes in planetary hours as well as changes in the rising sign. VOID OF COURSE LISTING USING THE ANCIENT RULES: A Void of Course listing that uses an ancient rule that the Moon is regarded as being Void of Course only if it enters the next sign unaspected has also been added. Medieval orbs and moiety rules are used so that this report is produced in accordance with the medieval rules. PRIMARY DIRECTIONS LIST: The Primary Directions list of planet to angular house cusp influences can now be calculated based on the calculations of Ptolemy, Cardan, Naibod, Placidus, and Kepler, as well as a modern variation discussed by Kolev and Cochrane. Kepler has only a method used by De Luce and by Van Dam, and these are also available in Sirius. CLICK HERE TO CONTINUE . . . . . . . . . . .